Anyone with half an interest in punk rock will know the name Tim Armstrong – Rancid’s frontman, songwriter and producer. And when he’s writing, he’ll reach for his Hellcat. Fender gives you the chance to do the same with the Tim Armstrong Hellcat – part of their acclaimed Artist Series. 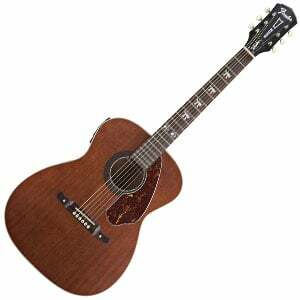 This affordable acoustic oozes attitude, while showing the qualities that make it a great acoustic for beginners as well as regular performers. Let’s check it out! This is one fine acoustic, which just screams punk rock. The design will be familiar to Rancid fans, as the appointments on this affordable model are identical to those on Armstrong’s own Hellcat (although adapted to right-handed players). It features a smaller concert body with a 25.3” scale length, which makes it more comfortable to hold when compared to a dreadnought – especially for beginners. With that dark grain, there should be no surprise to find out that the Hellcat is an all-mahogany model, with laminated mahogany used for the back and sides, and solid wood on the top. This top has scalloped X bracing under the hood, while cream binding adds definition and protection externally. It’s good-looking as it is, but then comes some detailing that makes this guitar truly unique. There’s the four-ply tortoiseshell pickguard and Tim Armstrong’s signature on the truss rod cover, while awesome Hellcat inlays run down the 19-fret walnut fretboard, punctuated by double skull inlays at the 12th fret. The maple neck itself is very playable with a C shape and slender satin finish. Good looks aside, what else does the Hellcat offer? It’s an electro-acoustic, so this signature model comes with a respected and popular system from Fishman, the Isys III, which comes with an active onboard preamp featuring volume and 3-band EQ controls (bass, mids and treble). This preamp also includes a convenient built-in digital tuner – essential for beginners and experienced players alike. Although, you may not need to use it much as the set of vintage-style tuners – with aged white plastic buttons – do a good job of holding your tuning stable. The rest of the hardware on this acoustic keeps things reliable with a rosewood bridge featuring a GraphTech Nubone compensated saddle, while the nut is made of the same material. The all-mahogany build, with that solid top, means the Hellcat offers a true, rich and warm tone that’s very pleasing to the ear. Despite the smaller build, the acoustic projection is good with ample resonance thanks to the bracing pattern. Through the Fishman system the tone is pretty organic and there’s plenty of sound tweaking capabilities thanks to the onboard controls. For an affordable guitar, it sounds great! Fender has done a great job of replicating a modern classic and we assume Tim Armstrong is very pleased with the results – because we’d be! The design has its roots firmly in radical punk rock, the playability is hard to fault, and the tone is exactly what you’d want both plugged and unplugged. For the affordable price, it’s a great buy. If you are interested in additional info about the Hellcat, click here.